Review Context: I like turn-based strategy games and this reminded me of Advance Wars from the Game Boy Advance, a game I really enjoyed. Disclosure: This review is based off of a review copy. 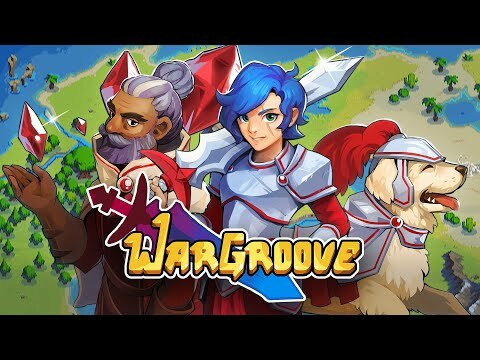 Wargroove, a turn-based strategy game developed by Chucklefish is a game that was announced in 2017, which has been on my radar ever since the announcement. The first thing you will notice about the game is the pixel graphics, as it may not be everyone’s cup of tea, but the genre and gameplay were the most appealing elements of it. Waiting patiently, the game finally came out in 2019, as I couldn’t wait to dive in and play this. Wargroove is not for everyone, especially if you are not experience in the turn-based strategy genre, as this could be a tough genre to suddenly dive into. When you start the campaign of Wargroove you embark on a journey with Lord Emeric and Mercia as sudden tragic events cause them to flee their kingdom for safety. During the course of your journey you will encounter different factions and commanders that help weave the story together, but the story is rather generic with little depth to it. The point of the campaign is to introduce you to the game mechanics, unlock modes (Arcade, Puzzle), and get you familiar with the different commanders. The first game that will likely go to your mind that Wargroove resembles is Advance Wars from the Gameboy Advance. 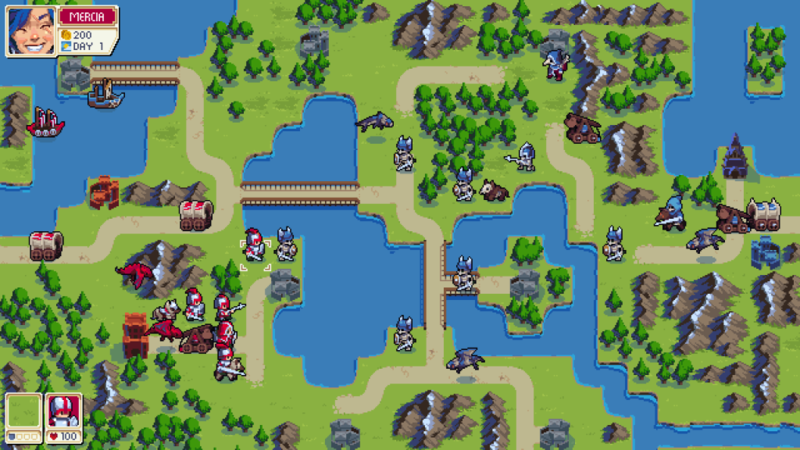 The turn-based gameplay of Wargroove is similar to Advance Wars, as you have to take control buildings (villages) to increase your gold production per turn, as well as using that gold in your barracks to buy new units. 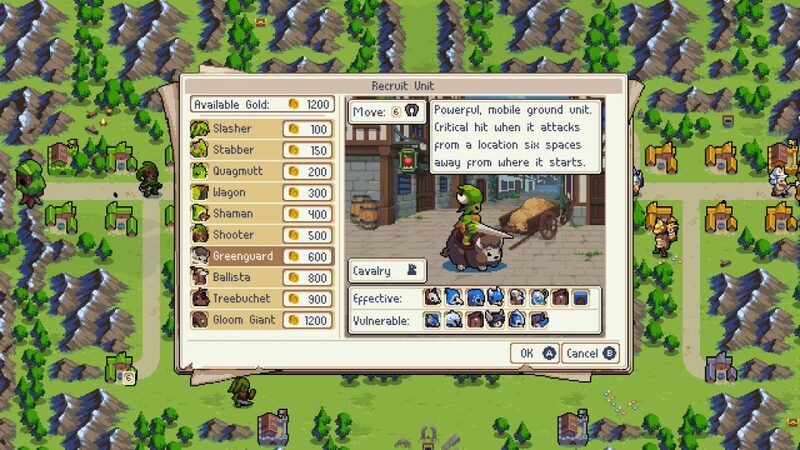 A lot of the strategy in Wargroove is what units to build and when and learning how to efficiently spend your gold. The campaign does do a decent job of introducing new units, but you are quickly thrown into the deep end, as the difficulty ramps up pretty quickly. Most of the battles end when either the commander or stronghold of either side dies. You also get graded after each level, with “S Rank” being the highest rank. The ranks in Wargroove are predicated on turns finishing the level, so turtling your way to victory will get you a poor ranking and star rating for the level. You do get to spend your level stars on extra content that appears to be just extra and unnecessary, but if you want to master each level you can replay the levels as many times as you want. I am personally not a player that likes to speed up things, as I prefer building that big army (a la Starcraft) then steamrolling, so this is a change of pace that I am getting used to. There are ten different commanders and four different factions in Wargroove, with the differences mainly in just commanders. This may upset some people, as the units are the same across the board, just re-skinned to the different factions. So far example, the Shaman and Alchemist both have the same functionality, are found in the same place in barracks user interface, and cost the same amount of gold. I have come to accept this, viewing this more of a chess game than a game like StarCraft with different races and units. The difference in your games will also come down to your commander choice and usage, as each commander has a special ability called a “Groove” that is charged whenever the commander engages in combat. Each commander is different, for example Lord Emeric has a defense crystal ability that gives extra defense to a bunch of units inside an area, and Mercia has an AoE healing ability. You will unlock these commanders during the course of your campaign to get your feet wet with the abilities. One of the best things about Wargroove is the amount of content provide through modes, whether it be Campaign mode, Arcade mode, Puzzle mode, Multiplayer, and the maps/campaign creator mode. During the campaign you will unlock commanders for the Arcade mode, in which you have to fight a series of battles with the commander of your choice. Puzzle mode is exactly as it sounds, as you have different scenarios to beat in a certain amount of turns. I haven’t spend much time in multiplayer (Yet! ), but multiplayer is both local and online, with up to four players, and is also asynchronous. This means you can have multiple games going at once without having to wait for your opponent. There is currently no multiplayer lobby system (it may be added in), but you can create a game and share the game code to get people to join. The best part of the multiplayer and maps/campaign editor is that there is cross-play among PC, Nintendo Switch, and Xbox One using just game codes. For the maps/campaign editor you have up to ten upload slots to put on the server. I haven’t played much with the editors yet, but just browsing the online list I can see that each creation has a rating and an icon denoting which platform it came from. Although I am enjoying Wargroove and will play much more of it, the game was released with a lot of quality of life issues. Most of them are expected to be addressed. In the current state, the user interface is the biggest issue. When you build a unit in the game you see a chart of what that unit is effective and vulnerable against, with the problem being that you only see a small pixel portrait and no tool-tips of the enemy name. Later down the line I can see this being second thought once I am more experienced, but for learning the counters initially this is a big problem without tool-tips. The portrait problem came up because I entered a campaign section where most of the enemies had similar faces, so it was hard to tell the difference between them. Once this fix happens the game will be a lot better. Another omission for the game is a lack of an enemy threat grid toggle for all enemies, in addition to just clicking on one enemy like included already. Bad user interface decisions are usually somewhat understandable, but the one decision to bury the options menu behind “Missions” after right-clicking an empty tile, in addition to forcing a right-click to to get to menus to begin with is baffling. The speed of the game is also expected to get quality of life improvements, but in the meantime the battles take up a lot of time with only holding right-click as a way to skip through the battle cutscene. The sound in Wargroove may be one of the most underrated things about the game, as the soundtrack is pretty good throughout, with little soundbites in certain cutscenes. The one sound element that didn’t go unnoticed by me was the stereo sound for the battle cutscenes, with sounds going from left to right or right to left, depending on the direction of the attack in the battle. The sounds are also available to use within the campaign editor. Wargroove was a game on my wishlist since it was announced and I am glad it is finally released. Despite the quality of life issues that will hopefully be cleaned up soon, I expect to keep playing this for the rest of 2019. I can’t wait to spend more time in multiplayer and also create my own campaign. More content about experience with multiplayer and the campaign editor may be added later.